I definitely prefer your alternative post suggestions! I could write one on the topic of #4 inspired by today's events, in fact. 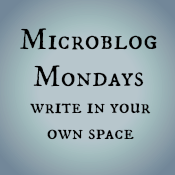 I didn't even know there were email list for blog topics! And I'm puzzled: the handwriting in the picture, is that from the email? Or did you write it yourself and then photograph? But lists like this would explain why people keep writing things like this; maybe it simply means they were uninspired, rather than convinced this is interesting to anyone. The handwriting in the picture is my own, photographed (poorly). 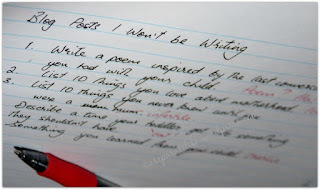 The title should have told me that, and while I'm not a poetry person, your handwriting looks like a poem in itself! I like your augmented list much better! Want to hear about your niece!! I've linked to the Charlie posts on A Separate Life. You'll regret saying that! It's funny, but I usually find it much more interesting when people talk about themselves as a child. What about those prompts? I love your edits to these prompts. So much more inclusive and interesting.